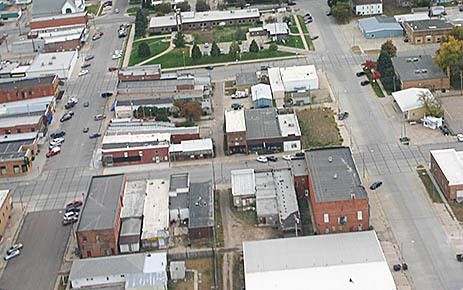 Aerial view of downtown Albion. Nebraska Department of Economic Development announced Tuesday afternoon that Albion will be one of seven communities to receive CDBG Phase I grants for downtown revitalization. Albion, population 1,645, will receive $30,000 in CDBG funds to develop a comprehensive downtown revitalization plan, including a blueprint for creating business and infrastructure improvements to help increase revenues and attract new investments. An additional $14,600 in matching resources will be used for the project. A total of $206,550 was awarded in Phase I grants to the communities. Other towns receiving the Phase I grant approvals were Cambridge (1,020 population), Gretna (4,165 population), Norfolk (22,835 population), Seward (6,050 population), Wausa (520 population) and York (7,450 population).